Finding reviews of the best pallet racking protector is not an everyday topic. Yet we are trying to fill a niche to help warehouse manager source the best products for their operations. below we’ve look at this critical product line to help you decide which products you should select and procure. What is a pallet racking protector? A pallet racking protector is an accessory that is designed to strengthen and protect pallet racking. In a dynamic environment such as a warehouse, bumps and collisions, typically from mobile warehouse equipment, like forklifts, hand pallet jacks and electric pallet jacks, are inevitable. Forklift-borne pallets can also catch corners, posts, and beams. Therefore rack protection is not only recommended by warehouse safety experts, but necessary. To be helpful, we have description a series of the products that you might want to install through this WarehouseIQ product category roundup. Excessive wear and tear to pallet racking can weaken its capability to hold inventory. When its integrity is compromised this can pose a massive safety hazard to operations in a warehouse. A collapse of a loaded pallet racking is not only dangerous to workers and pedestrians, but it can result in shutdown of operations, loss of productivity and physical damage to a warehouse and its stock. Pallet racking protectors are made variously of rubber, plastic and usually steel. They are designed to absorb the energy from bumps so that it is not transferred to the racking structure. Who makes the best pallet racking protector products? These companies are some of the leaders in the market that provide pallet racking protectors, as well as other safety products for the warehouse business and for industry in general. A bollard is a short post that is used to guide traffic and protect from vehicle impacts. The plastic versions can be used as vehicle guides and do not offer much impact protection. Typically bollards are used to obstruct a vehicle from colliding with pallet racking. This kind of bollard is made out of steel and is bolted to a concrete floor. Row of these is your best option to thwart a collision with racking, or other warehouse equipment and structures. 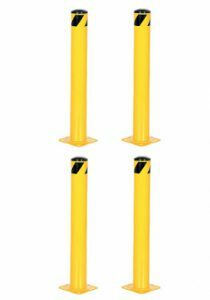 Some bollards come with bolt kits for easily installation. You can see various bollard options here. While bollards are perhaps the best best pallet racking protector, they also don’t offer much protection to the forklift that hits them. However, they can stop disastrous impacts, thereby maintaining safety and prevent massive insurance claims. Rack guards are accessories that attach to the floor to protect racking uprights. They are made of steel and rubber. They are designed absorb the impact of a collision, and to minimize damage. These are bolted to the floor and usually are painted with corrosion proof paint. Besides protecting pallet racking, they can also be installed to shield wall corners, and other equipment from damage due to collision. See a selection of rack guards here. These innovative and easy to install guards are made of plastic and are designed to inhibit impact. They attach to the face of the upright frame, however they are not bolted. These systems won’t stop a forklift or pallet when it strikes racking. They are intended as impact absorbers. See rack guard products. Recommend brand: Yellow Jacket and Eagle. 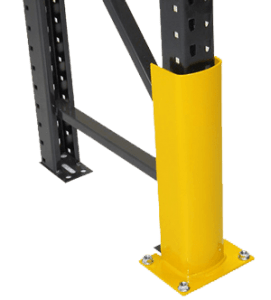 Finally, there are a lot of vendors out there that provide products and claim they have the best pallet racking protector in each product variation. We see a lot of them every other year at Promat. If you have a comment about these products or a recommendation, send us a note at [email protected]. Please note: As per FTC regulations, some or all of the links on this page may contain affiliate links.